If you thought that the recent weather was scorching, even by summer standards, you're right. 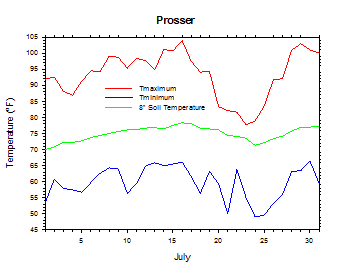 July 2014 was Prosser's warmest month since at least 1990, and eclipsed the previous record-holder (July 1998) by more than one degree in terms of both mean and mean daily high temperatures. Two major heat waves were observed in eastern and central Washington during the month. The first occurred around mid month, as the Tri-Cities peaked at 109 degrees on July 16th. Although the maximum temperatures were not historic, the longevity and consistency of the hot weather was nonetheless rare. 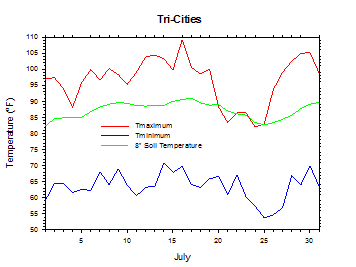 In total, there were 10 days featuring 100°F+ high temperatures at WSU Tri-Cities during July, and even the daily average temperature was above 90 degrees on the 16th. Last month also featured more than its fair share of balmy nights. 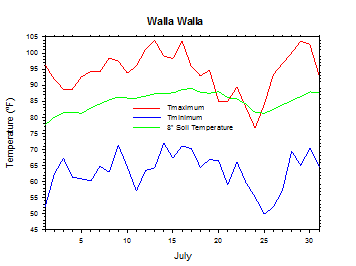 On July 13th, Wahluke Slope's low temperature was an incredible 84 degrees. For the month, Wahluke Slope's low remained above 70 degrees on a total of 18 days. Furthermore, conditions on the 12th and 13th were unusually humid by Northwest standards, with numerous instances of dew point temperatures in the 70s. Wildfires were an unwelcome yet eerily familiar consequence of the extreme heat and drought, as numerous conflagrations raged out of control across much of north central Washington. At 405 square miles, the Carlton Complex fire is the largest in our state's history. Hundreds of homes were destroyed, and large smoke plumes darkened the skies across much of eastern Washington. One of the only deviations from an otherwise hot and smoky month was an unusually strong upper level low that brought rain and even thunderstorms to the state on July 23rd. 1.51 inches of rain fell at Lawrence, and winds gusted to 50 mph at FishHook. 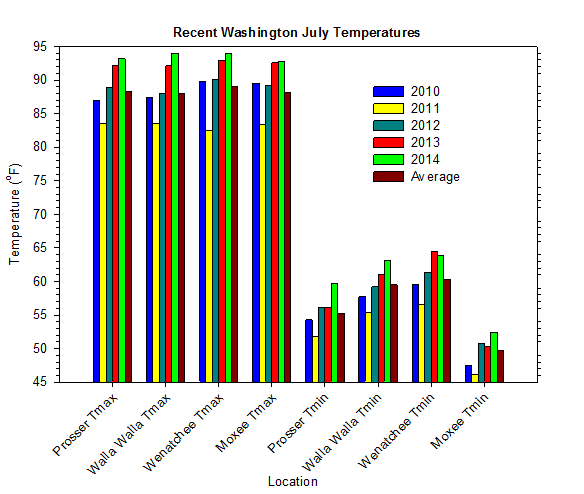 However, following the slight meteorological detour, heat returned in earnest for the final week of the month, as Washington reverted back to its default climate state. Overall, July's temperatures were well above average, and rainfall was generally sparse in the east. 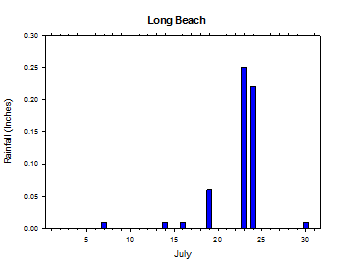 Despite a number of hot days for interior western areas, the coast was largely able to escape the oppressive heat due to the preponderance of onshore flow. July began with very hot conditions statewide. Highs on the 1st were in the 80s and 90s, including 99 degrees at St. Paul South. Lows were in the mid 40s to 60s. As marine air slowly advanced toward the extreme heat on the 2nd, there was a wide range of temperatures. Highs varied from 66 degrees at Tokeland to the upper 80s to around 100 degrees east of the Cascades. Highs on the 6th were in the upper 80s to 90s in the east, and 70s to 80s in the west. Lows varied from the mid 50s to mid 70s. Most areas were sunny, although a few clouds and sprinkles could be found in extreme northwestern Washington. 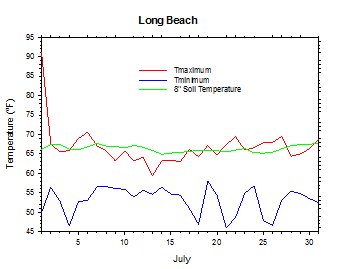 High temperatures on July 10th reached into the 90s in central areas, but only the mid to upper 60s at the coast. Lows were in the upper 40s to low 70s. Highs on the 13th peaked in the mid 90s to mid 100s east of the Cascades, and 70s and 80s in the west, except 60s at the coast. Lows were mostly in the 50s to 70s. Much of the southwestern half of the state was somewhat cloudy and very humid, as isolated thunderstorms occurred. It was partly sunny on July 14th, with highs in the 90s to mid 100s in eastern areas, and mid 70s to mid 80s in the interior west. 0.26 inches of rain fell at Brewster Flat in southern Okanogan County. High temperatures on the 16th ranged from the 60s at the coast to the 80s in interior western areas to the upper 90s to 100s in the east. Lows were in the 50s in the west, but mainly the 60s and 70s east of the Cascades. Unfortunately, smoke from fires in the north Cascade east slopes worsened and was dispersed across eastern Washington. Highs on the 20th were in the 60s to low 70s in the west, and 70s to 80s in the east. Lows were in the 50s to mid 60s. Light rain fell in parts of the Puget Sound, and westerly winds continued in the east. Highs on July 22nd reached the 80s in southeastern areas, while other regions remained in the 70s or even upper 60s. Lows ranged from the upper 40s in parts of the west to the upper 60s in some south central areas. Rain fell in parts of the state, and especially the southeast. 0.54 inches fell at Anatone, including 0.45 inches in only 15 minutes during a thunderstorm. July 23rd was a remarkably variable weather day that featured blustery conditions, rainfall in western Washington, and thunderstorms in eastern areas. There were numerous reports of torrential rains, strong wind gusts, and large hail associated with the convective activity. High temperatures increased rapidly from west to east, and ranged from the 60s in the west to the 80s in the eastern border areas. Lows were in the upper 40s to low 60s. 1.51 inches of rain fell at Lawrence, as rain fell across much of the state. Winds gusted to 50 mph at FishHook. High temperatures on July 24th were pleasant, and ranged from the low 80s in parts of central Washington to the 60s and 70s elsewhere. Lows were in the 40s and 50s. Even as the upper low departed Washington, rain lingered in northwestern areas, including 0.4 inches at Lawrence. Otherwise, breezy southwesterly winds persisted, with daily average values as high as 15 mph in parts of eastern Washington. Highs on July 25th reached the 60s at the coast, and upper 70s to 80s in central Washington. Lows were in the mid 40s to 50s. Highs on the 29th reached the upper 90s to 100s in the east, and 70s and 80s in the west. Lows were in the upper 40s to around 80 degrees. Highs on the 30th climbed into the mid 90s to mid 100s in central/eastern areas, and mid 70s to 80s west of the Cascades. Lows were in the upper 40s to 70s. Thus, the month appropriately concluded with hot and calm weather. The average July temperature at Prosser (WSU IAREC) was 77.1°F, which is 4.5 degrees (1.7 standard deviations) above average. The average high temperature was 93.2°F, which is 4.9 degrees (1.4 standard deviations) above average. The average low temperature was 59.7°F, which is 4.4 degrees (1.8 standard deviations) above average. 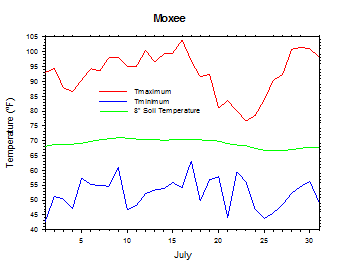 The maximum temperature recorded last month was 103.9°F on July 16th, while the coolest daily high was 77.7°F on July 23rd. 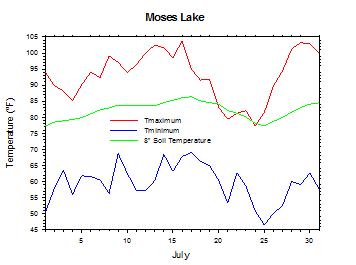 Low temperatures ranged from 66.5°F on July 30th to 49.1°F on July 24th. Daily average temperatures ranged from 84.9°F on the 16th to 64.6°F on the 24th. The monthly precipitation total was 0.17 inches. 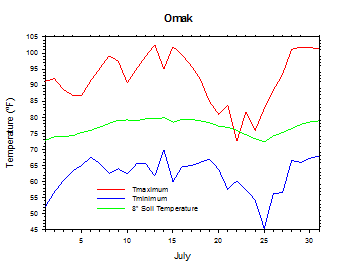 The average wind speed was 4.0 mph, and the average 8 inch soil temperature was 74.9°F. 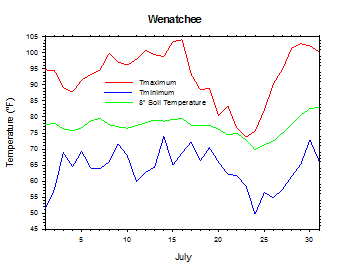 Wenatchee (WSU TFREC) recorded an average temperature of 79.2°F, which is 3.8 degrees above average, while Walla Walla's average monthly temperature of 78.7°F was 4.5 degrees above average. 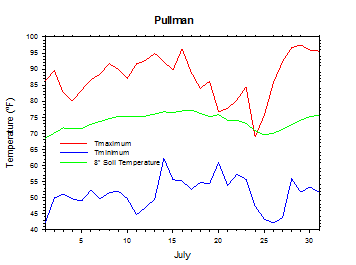 Pullman was one of the cooler spots in eastern Washington, with an average July temperature of 70.4°F. In western Washington, Mt. 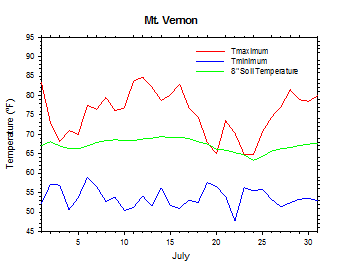 Vernon's average temperature was 64.1°F, which is 2.1 degrees above average. July 16th: The high temperature at Tri-Cities was a scorching 109 degrees. July 23rd: 1.51 inches of rain fell at Lawrence. July 24th: The high temperature at Thorp was only 66 degrees. As of July 14th, winter wheat harvest had begun in Whitman County. In Grant County, the cherry harvest was complete, and the potato harvest was in progress. Peaches and nectarines were being harvested in Yakima County, while apple thinning continued. Apricot harvest peaked in early July, while the harvest of late variety cherries continued in cooler parts of the Yakima Valley. Uncontrolled fires in north central Washington during the third week of July scorched the edges of some orchards, and also burned some winter wheat crops. In the Yakima Valley, growers were using cooling operations to protect crops from the extreme heat. Scattered thunderstorms in Lincoln County brought isolated areas of rainfall, but also lightning and some hail damage to the winter wheat crop. In late July, wildfires continued to kill cattle and wreak havoc on agricultural in especially north central Washington. Thunderstorms led to areas of hail, which damaged wheat in Whitman County. Otherwise, peach and plum harvest continued in Yakima County. On July 16, 1993, Prosser (WSU IAREC) recorded a high temperature of only 69 degrees. 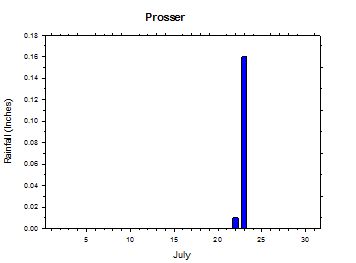 In fact, during the entire month, Prosser's temperature never reached 90 degrees! According to the Climate Prediction Center, above normal temperatures are likely for the remainder of 2014 and well into 2015. There are enhanced odds for below normal precipitation during the autumn and winter, with no clear signals at other times. El Niño continues to develop, and is expected to peak at moderate strength during the late autumn or early winter.